The tools you need to create a rustic look with crackle paint are quite simple. A quick trip to the nearest hardware store or do-it-yourself center will put all the tools you need at your disposal. Sandpaper/Sander. Surface preparation is a key component of successful results. Sanding is usually one step you need to take. It helps to smooth out any irregularities and cut any gloss that could prevent paint from sticking. Usually a fine grit sandpaper is sufficient, 150 grit. For rough cabinets needing a lot of sanding start with 120 grit and finish with 150 grit, this will make a nice smooth cabinet ready for the primer or base coat. 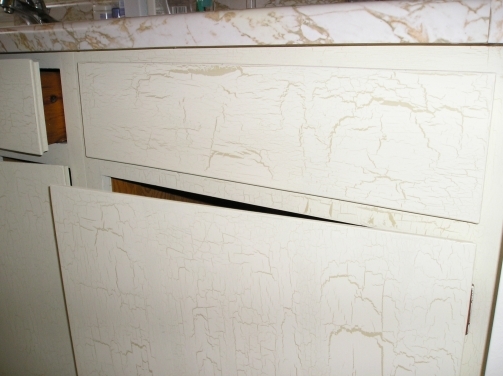 If you are preparing multiple cabinet doors for a crackle finish, a sander can speed up the process. Clean White Rag. An old white t-shirt is great for this kind of work. The advantage of white is the fact you can see if you are picking up the dust. A slightly damp rag is good for picking up the fine dust left behind after sanding. Vacuum Cleaner. You’ll find that vacuuming away any dust is also very effective. Latex Paint. You’ll want two colors. Use two shades of two similar colors if you want a subtle effect. If you want a country effect, use a brighter color for the first coat of paint and a neutral color for the top coat. 1/4-inch or 3/8-inch Paint Roller. Use a roller for the base coat, unless you’re only working in a small area. It will save you a lot of time over using a brush. The effect tends to be smoother as well. You can use a mini-roller in most cases, these are 4-6 inches long and skinny. 2 and 3-inch Paint Brush. You’ll need a brush to apply the crackling glaze. And you will also need a brush to apply the top coat of paint. Natural Sponge. You’ll want a natural sponge to apply the crackling glaze or final coat of paint with if you want fine hairline cracks. The sponge makes it easier to control how thick you apply the glaze, and creates a pattern that discourages the formation of large cracks. Dropcloth. You need to protect your workspace. Newspaper will do in a pinch, but dropcloths generally offer better protection from drips. These are the basic supplies you need to have before you start your crackle painting project. Now let’s learn How to Crackle Paint in Four Steps.